In order to maintain valid Pesticide Applicator Certification in the state of New Jersey, pesticide applicators must earn a minimum of 24 recertification credits by attending continuing education courses. Reed & Perrine Turf & Ornamental Seminar. 2012. Commercial Pesticide Applicators must accumulate 8 Core credits and 16 category credits (per each category certified). Private Pesticide Applicators must accumulate 8 Core credits and 16 ‘PP2’ credits. The total 24 recertification credits must be accumulated by the applicator within a five year period subsequent to passing their certification exam. The five year period begins the November 1st following passing the exam, and ends five years later on October 30th. If the full complement of recertification credits is not earned within that five year period, certification as a pesticide applicator in New Jersey expires. Certification in these cases can only be acquired by passing the required exams again. New Jersey-certified pesticide applicators can go to the ‘DEP Data Miner Pesticides‘ webpage and access their current license information and recertification status in the report called Commercial Certified Pesticide Applicators – Specific Information. Applicators can check to see how many recertification units they have accrued by CORE, CORE Category, or PP2; as well as make sure that their license is still current. The New Jersey Department of Environmental Protection (NJDEP) evaluates all recertification courses. Course topics offered for recertification credit include: Core (private or commercial certifications), PP2 for private certification, as well as each of the 13 commercial pest control categories. Recertification credits can be earned by either attending NJDEP-approved recertification courses, or by completing an NJDEP-approved online training module. Recertification Course by Specific Date: You can search for a recertification course on a specific course date. Recertification Course by Course Number: You can search for specific recertification courses using the NJDEP course number. Recertification Courses Available: You can search upcoming pesticide applicator recertification courses by subject area. [i.e., CORE, Category, or Private (called ‘PP2’)] within a date range that you specify. Rutgers recertification class: “Planning to Minimize Risk: Spills”. Rutgers North Jersey Ornamental Horticulture Symposium Turf Day. NJOHS-2019. January 7, 2019. Location: County College of Morris. Randolph. Contact: Jan Zientek (RCE Essex); essexrce@njaes.rutgers.edu . Rutgers North Jersey Ornamental Horticulture Symposium Tree Day. NJOHS-2019. January 8, 2019. Location: County College of Morris. Randolph. Contact: Jan Zientek (RCE Essex); essexrce@njaes.rutgers.edu . Rutgers North Jersey Ornamental Horticulture Symposium Landscape Day. NJOHS-2019. January 9, 2019. Location: County College of Morris. Randolph. Contact: Jan Zientek (RCE Essex); essexrce@njaes.rutgers.edu. The New Jersey Nursery & Landscape Association’s Total Pro Expo. January 29 & 30, 2019. Location: New Jersey Convention Center; Edison, NJ. 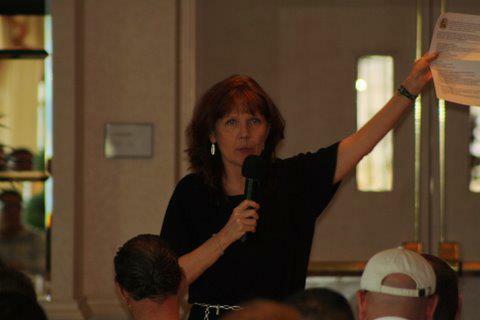 Contact: Lori Jensen, Executive Director, NJNLA. Atlantic Coast Agricultural Convention & Trade Show. February 5 – 7, 2019. Vegetable Growers Association of New Jersey & Rutgers Cooperative Extension. Location: Harrah’s. Atlantic City, NJ. Rutgers Blueberry Open House 2019. February 19, 2019. Location: Frog Rock Country Club. Hammonton, NJ. Gary Pavlis (RCE Atlantic) pavlis@aesop.rutgers.edu; 609-625-0056. Reed & Perrine Lawn Talk Conference. February 20, 2019. Location: Battleground Country County Club, Manalapan. Rutgers Central Jersey Vegetable Growers Meeting. February 22, 2019. Location: RCE Mercer; Ewing, NJ. Contact: Meredith Melendez (RCE Mercer); melendez@njaes.rutgers.edu; 609-989-6830. Rutgers North Jersey Commercial Vegetable Growers Meeting 2019. February 28, 2019. Location: RCE Hunterdon; Flemington, NJ. Contact: Pete Nietzsche (RCE Morris) 973-285-8307 x2. Rutgers South Jersey Tree Fruit Growers Meeting. March 6, 2019. Location: Rutgers Agricultural Research and Extension Center (RAREC). Bridgeton, NJ. Contact: Hemant Gohil (RCE Gloucester); hlg50@njaes.rutgers.edu; 856-224-8029 . Rutgers North Jersey Tree Fruit Growers Meeting. March 7, 2019. Location: RCE Hunterdon County. Flemington, NJ. Contact: Megan Muehlbauer; muehlbauer@njaes.rutgers.edu; 908-788-1339. 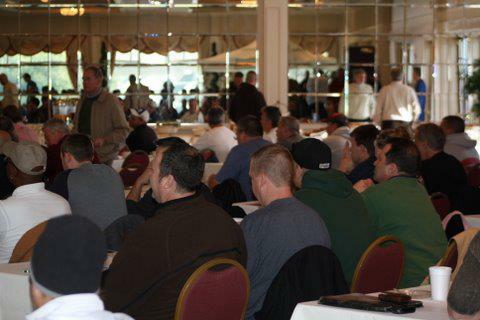 Rutgers South Jersey Nursery Growers Meeting. March 11, 2019. Location: RCE Cumberland. Contact: Salvatore Mangiafico (RCE Cumberland); mangiafico@njaes.rutgers.edu; 856-451-2800. Sports Field Managers Association of New Jersey 2019 Spring Field Day. April 17, 2019. Location: Rutgers University Athletic Facilities, Piscataway. Contact: Debra Savard (Executive Secretary, SFMANJ); mail@sfmanj.org; 856-514-3179. Rutgers Turf Program Golf & Fine Turf Field Day. July 30, 2019. Location: Rutgers Hort Farm II. New Brunswick, NJ. Rutgers Turf Program Landscape Turf Field Day. July 31, 2019. Location: Rutgers Adelphia Research Farm. Freehold, NJ. South Jersey Tree Fruit Growers Twilight Meeting. March 27, 2019. Location: RCE Gloucester. Contact: Hemant Gohil (RCE Gloucester). hlg50@njaes.rutgers.edu; 856-224-8029. Vegetable Integrated Crop Management Twilight Meeting. TBD. Vineland. Rick VanVranken (RCE Atlantic) vanvranken@njaes.rutgers.edu. Rutgers North Jersey Tree Fruit Grower’s Twilight Meeting Series Part 1. April 4, 2019. Location: Stony Hill Farms; Long Valley, NJ. Contact: Megan Muehlbauer (RCE Hunterdon); muehlbauer@njaes.rutgers.edu; 908-788-1339. RSVP: Kim Fry at (908)788-1339. Rutgers North Jersey Tree Fruit Grower’s Twilight Meeting Series Part 2. May 8, 2019. Location TBD. Contact: Megan Muehlbauer (RCE Hunterdon); muehlbauer@njaes.rutgers.edu; 908-788-1339. Winegrape Grower’s Twilight. TBD. Contact: Hemant Gohil. hlg50@njaes.rutgers.edu. Rutgers Blueberry Growers Twilight Meeting (30 minutes). May 2019. Location: TBD. Gary Pavlis (RCE Atlantic); pavlis@aesop.rutgers.edu. The New Jersey Pest Management Association’s 72nd Annual Clinic, Trade Show & Clambake. August 15, 2019. Location: Rutgers University; New Brunswick, NJ. Contact: Len Douglen, Executive Director, NJPMA. classes@njpma.com. Rutgers NJAES Office of Continuing Professional Education offers a selection of landscape pest control and pesticide courses offering recertification credit, typically scheduled in the fall through early spring. Please contact your local county Rutgers New Jersey Agricultural Experiment Station (NJAES) Cooperative Extension, or Rutgers PSEP (848-932-9802) to inquire further about Rutgers pesticide applicator outreach in New Jersey. 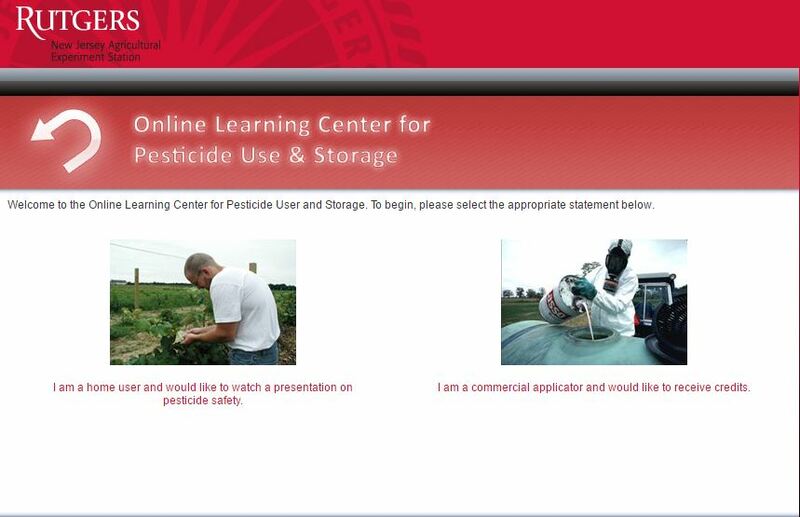 Rutgers Cooperative Extension currently offers two approved online CORE recertification courses in Pesticide Use & Storage. There are two options to select on the home page; select I am a commercial applicator and would like to receive credits. After you enter your license number, both modules will post for you to select your choice. More modules will be added at the course website as they are developed. Pested.com – Contact: Kevin Hurley; email; 845-657-6483. Source: NJDEP. www.nj.gov/dep/enforcement/pcp/bpo-recert.htm; date accessed 1/21/2017.